Upon reaching the field a signal will be given by the Squadron Leader, dipping of right wing, upon this signal the low section will get into right echelon on the No. 1 and 2 flights. The Squadron Leader will circle the field to the left and make an upwind approach to the runway in use during which time he gives landing signal, lowering landing gear. Number 3 aircraft of lead flight will get in right echelon by crossing under leader on this signal. When Leader gets to the end of runway, he makes a sharp peel off and lands using as short approach as possible. Aircraft #2 and 3 continue on for 15 and 30 seconds respectively straight ahead and peel off. Landing will be 30 seconds behind the leader. Just prior to peel off by the Lead flight, the second flight will start a 360 degree circle to the left and follow the same procedure as the Leader of the Lead flight. The Low Section, #3 and 4 flights, will circle field to the left during which time the Leader will get a correct interval to bring his section in for peel-off, following the same procedure as Lead Section. Let down will be on line from Harrington Buncher Beacon to the field magnetic heading of 96 degrees, now wind. Upon signal from Squadron Leader , dipping of right wing, the No. 's 1 and 2 flights will go into right echelon. The Low Section #3 and 4 flights will fly right echelon off the #3 aircraft in the second flight. The Squadron will approach the Buncher on a reciprocal heading to that of the let down, 276 degrees, no wind, for peel-off. The Squadron Leader will have an airspeed 155 I.A.S. and will be approximately 250 feet above undercast. 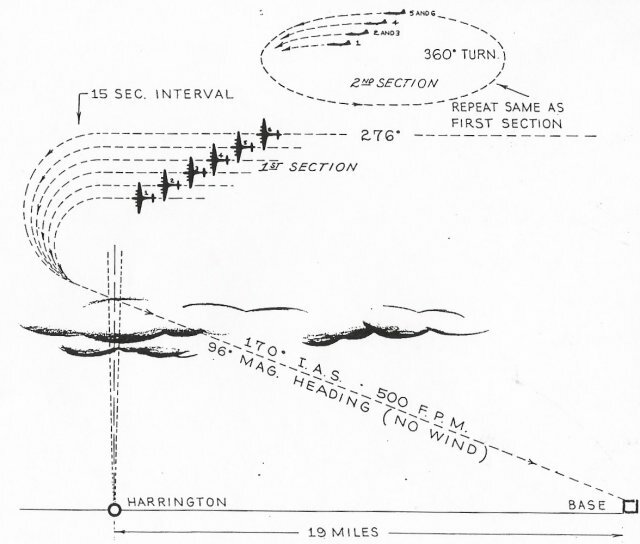 Peel of will be at 15 second intervals and aircraft will enter undercast at Harrington Buncher Beacon. Let down will be 170 I.A.S. and 500 feet per minute. It will be each pilots responsibility to keep proper interval between aircraft by adhering strictly to and airspeed of 170 I.A.S. and a let down of 500 feet per minute. In case of the overcast is such that aircraft on letting down are still in the overcast at a point over the field, he will continue letting down on the same heading until same aircraft is in clear before doing left hand turn to return to field. Upon reaching field, aircraft join pattern and land. Night landing will be the same as day landing, except that the Lead Section, No. 1 and 2 flights, will approach the field and circle to the left at 1000 feet. The Low Section, No. 3 and 4 flights, will approach and circle te field at 1500 feet. The High and Low Squadrons will be given an altitude to circle the field by flying control. There will always be 500 feet between the two sections in each Squadron. Each section lets down 500 feet in succession until landing is completed. Pilot will have his full crew alerted and each aircraft tail gunner will use Aldis lamp signal. Special effort will be made at night to use the radio as little as possible, and to rely on signal lights from Flying Control Tower.